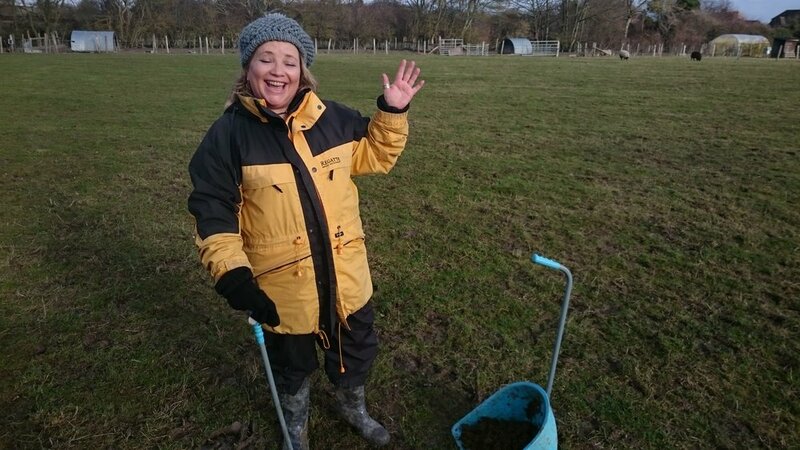 Feb 2017 Because of the current risk of Avian flu from wild birds, all the chickens are shut in a polytunnel, and we all needed to dip our wellies in disinfectant before entering the yard. Then we split into three groups. 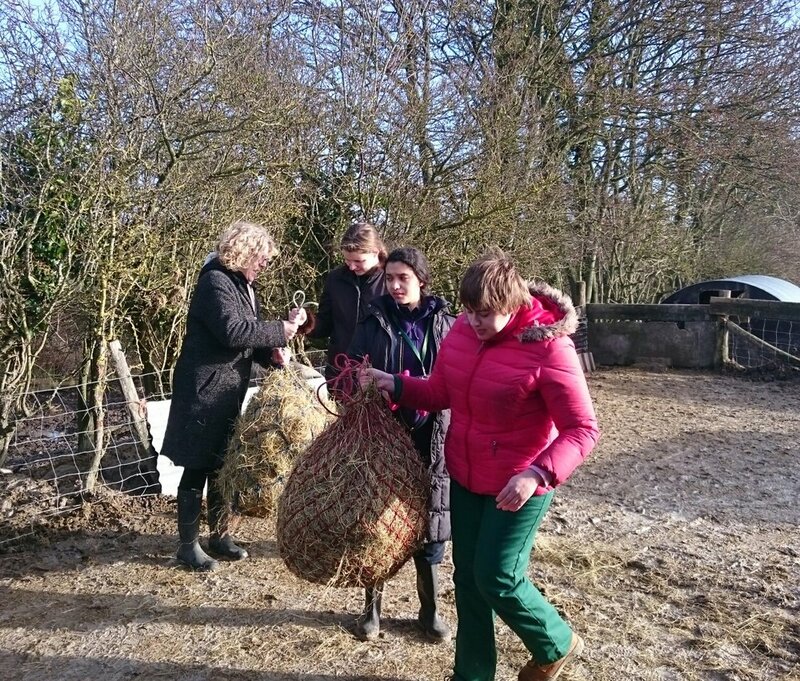 Some of us filled nets with hay for the ponies, with one person holding the net open, the other stuffing the hay in. This caused much interest for Frankie, who put his head over the door and tried to eat the hay as we worked. After the bags were full, we put them on the gates for each of the three ponies to eat. A couple of sheep came for a nibble too. Another group mixed up the pig feed. Owena was putting the food into the open trailer which she'd placed in an opening next to the field for them to eat inside. This is because one of the pigs is going to the abattoir next week and she wanted the pigs to get used to going in and out of the trailer before taking one of them away in it. It took a bit of getting used to, but they got there. 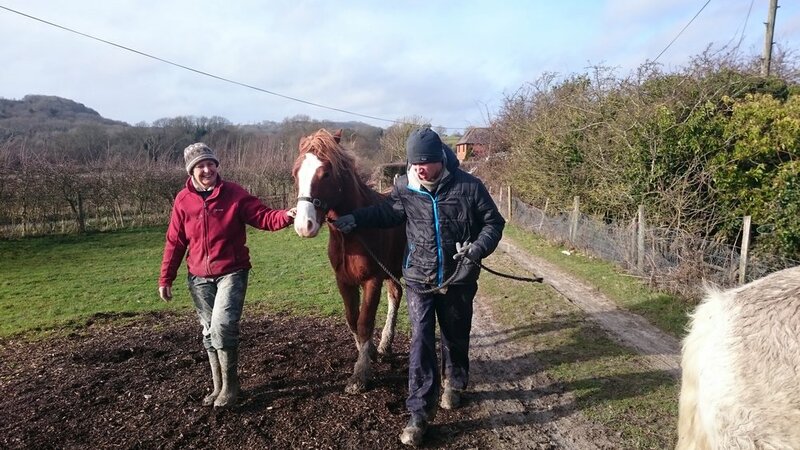 The third group went to clear horse manure from the pony field. Then, some students went off with Ivan to trim brambles in the sheep field, and Owena showed Connor, Natalie and Ebbie how to lead Buster and Frankie on the head collar in such a way that they don't push you off the path you want to follow (you sort of have to lean into them). 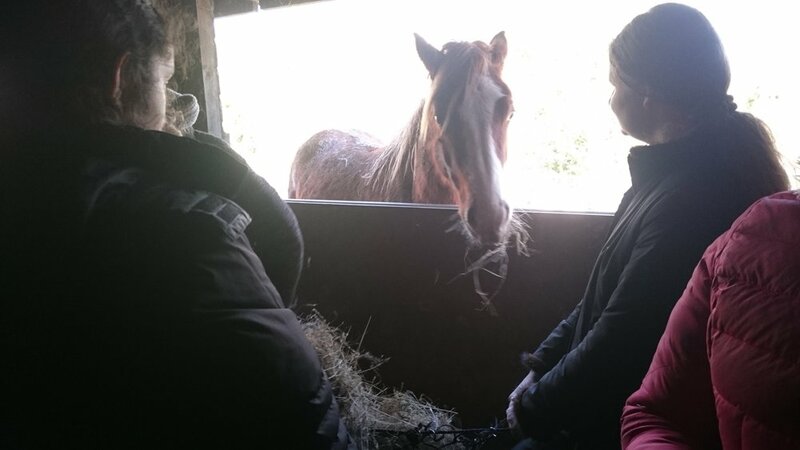 Owena also explained that, although the ponies are very muddy, it wasn't a good idea to groom them when their hair is wet. Ponies can get mud fever if mud gets brushed into their skin. Finally, the whole group gathered for some hot chocolate to warm up.